MONTPELIER STATION — Former U.S. Sen. John W. Warner said the forests at James Madison’s Montpelier, and a new trail with exhibits showing how forests should be managed, allow the public to experience nature as Madison would have wanted. Warner was the featured speaker at an event Saturday opening Montpelier’s new Demonstration Forest Trail, a mile-long loop trail that runs through the area’s tended forests where residents can learn about forest management techniques. Those involved with the project said the goal is for any person who walks the trail to learn about sustainable forestry. Warner, 83, kept his remarks brief, saying those attending should explore the “grandeur” of the estate and its gardens. “The evening is just beautiful,” he said. With the opening of the new trail, those associated with Montpelier emphasized that Madison’s conservationist nature is likely why there is so much forest on the property. 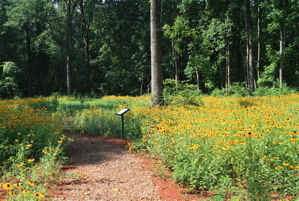 Residents were also able to take guided tours on the new path, which extends from the James Madison Landmark Forest — a 200-acre expanse that was designated as a national natural landmark by the U.S. Department of Interior in 1987 — and meanders through 30 or 40 acres of Montpelier’s tended forests. Christian Cotz, the manager of student and family programs at Montpelier, said in an interview that landowners are able to have healthy forests that are used and managed, or even have trees that have been cut. “Sometimes in order to sustain a forest, you have to trim a forest,” he said. Along the trail, visitors can observe forestry management techniques at four stations. Cotz said that of all the forest at Montpelier, only the Landmark Forest remains untouched. “The rest of Montpelier’s forest is actively managed,” he said. John Douglas Hall, who portrays the fourth president at Montpelier, said he hoped the new trail and its exhibits would do several things, one of which was to spark new energy for conservation in subsequent generations. “I look forward to seeing you among the trees here for the next several months and years,” he said. The new trail will be open for self-guided tours from 9 a.m. to 5 p.m. April through October, and from 9 a.m. to 4 p.m. November through March. The Ballyshannon Fund suggested and funded this Demonstration Forest Trail. Normally, we wait for good ideas to come to us...but not always...and this project is one we are really proud of. So, go take a hike ... and let us know how you liked it. There is a lot to learn about forest and wild game management, and lots of places to learn it. A great place to start is the Forest Landowners' Update or use the Envirothon Flash Cards, (widely available via Google search). If you would like to know more, please check out the thoughtful articles we have collected or the other reference links we maintain. Don't you have some friend who would like to know more about forest management? Can you help us teach them? All it takes is a bit of time, a little walking and an open mind about economic realities.